It’s so hard to believe that 2015 is winding down and with it comes all the “countdowns” to the beginning of a new year. 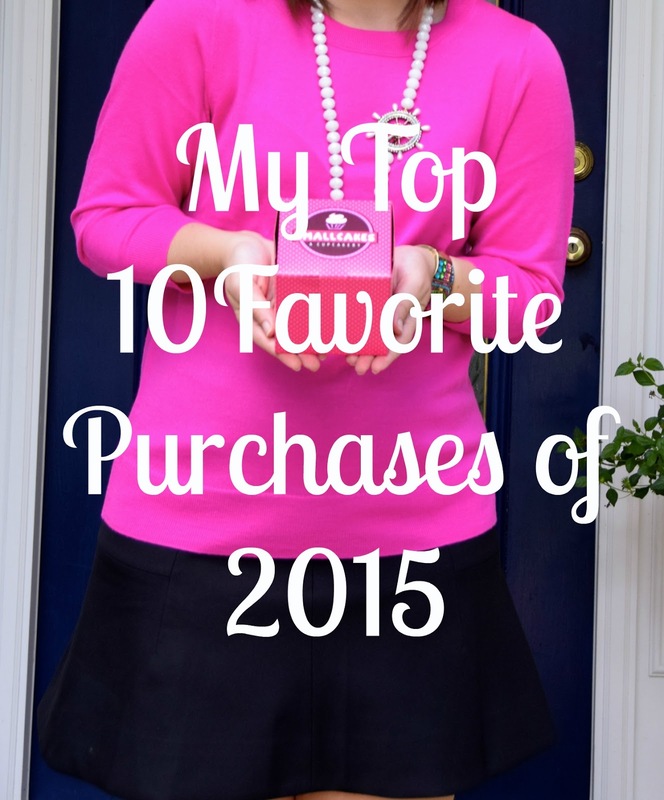 I thought it would be fun today to share with you my 10 favorite purchases of 2015! Let’s be honest, I shop some a lot, so when I find something that sticks out as fabulous you know it’s good! And, if you have any shopping left to do, this may spark some ideas for you! Hands down my Barrington St Anne tote has got to be one of my favorite purchases of the year! I am hard on my bags- they have to hold a lot and go with me everywhere- and this one has definitely risen to the challenge! I love that the bag itself is super lightweight, which means that I can fill it to the brim without extra weight, and it is so roomy. Add to all that the fact that it’s completely customizable… and I’m sold hook, line, and sinker 😉 Trust me y’all- this bag is life changing! When it comes to my beauty products I am definitely a creature of habit, so I was distraught when my Clinique make-up remover of over 5 years was discontinued. Luckily, I was at Nordstrom, and the Philosophy consultant recommended the Purity facial cleanser. After an ugly incident in college when I tried new makeup and broke out in hives, I was very nervous to try it; but y’all this cleanser was a game changer! (Note: Nordstrom’s will give you a take-home sample to try before you commit – I tested this cleanser for a week before I came back to the store and purchased). After a week of testing it out, my sensitive skin said “yes” and I’ve been using it ever sense! I may be a teeny bit late to the party, but I got my first (three) Rayne necklaces this year and I couldn’t be happier with them! I wear my magenta one the most (seriously it matches more than you think it does!) but all the colors are fabulous and they are the perfect throw-on-and-go piece of jewelry. Treat yo’ self this season and pick one up- you won’t regret it! This year I also picked up my first pair of Tory Burch wedges in the Sally style, and my cost-per-wear has to be pennies at this point because I wear them nonstop! At least 2-3 times a week I reach for these beauties and the are the perfect finishing touch for my workweek looks. I love that the wedge isn’t too high so they are comfy to wear all day and running around the office. I’m a big fan! I needed a bit of encouragement at the beginning of the year to get back in the workout groove, and the Fitbit Charge HR was perfect for providing that encouragement! I appreciate that the Charge HR shows all your info on the display screen so I don’t have to sync it with my phone to know where my steps are at. But, it really is so encouraging to see how much (or little) you are doing each day and it boosts me to get up and go! Year after year, these J. Crew Factory pleated skirts are staples in my wardrobe- I wear them at least once a week! I have too many colors to count (or maybe I don’t want y’all to judge!) but I absolutely love them. The solid colors are great because I can add on any pattern or color for a cute work outfit, and the patterned skirts are perfect for a chambray button up- the possibilities are endless! I guess technically this year wasn’t the first one in which I bought an Elsa top, but they most definitely are one of my favorite purchases that I make each year! I know you’ve heard me rave on and on about them- but you can wear them about 394756189 different ways and I am their #1 fan! “Dripping in Jewels” is the newest addition to my collection (in fact I just wore it last night) and it was a big hit! My Bourbon and Bowties bracelets are another great wardrobe staple of mine and I just keep adding to my collection with new colors and styles. 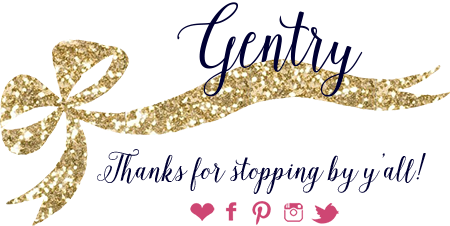 They are so great because you can truly mix and match any of them together and you get a fabulous arm party no matter what! 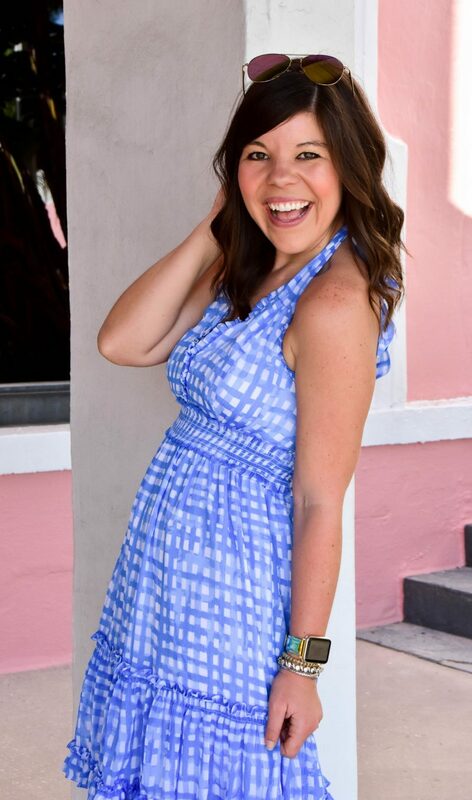 Finally, I love love love the swing dresses I have added to my closet from Old Navy! They are made of the softest jersey material, they don’t cling to any curves and they hide any “food babies” you may get during the day 😉 I also love that they are nice and simple so you can dress them up or down any way you want and it always looks unique and different! They are a workhorse for your wardrobe! So there you have it! What were your favorite purchases this year? Anything I should try in 2016?? Let me know in the comments below! And as always thank you so much for reading! Next Post What to Wear on Christmas Day! My barrington tote is one of my favorite bags too. I just love it! I've been wanting those Tory Burch wedges for years now. Maybe I'll finally treat myself for my birthday next month! Love all you favorite picks!! I just got a Rayne necklace this year too and love it- I want the marble color next. And I'm obsessed with my TB wedges that Ryan got me for graduation.. you're right, they're super comfortable and look so polished. I'll definitely be getting more in the future! Olive the Rayne necklace and JCrew skirt as well. These are some great purchases! I bought a lot swing dresses this year! So comfy! 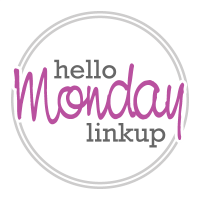 This is such a fun post idea! I definitely stocked up on Kendra Scott this year- so worth it. I love how fun and versatile they are! Those dresses are so flattering! On everyone!